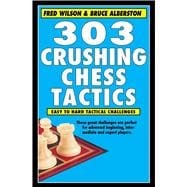 Both a fascinating challenge and great training tool, these 303 awesome tactic puzzles are not only super fun to solve but great for beginners, advanced beginners, and intermediate players to use as tools to win chess games. Tactics are presented in order of difficulty so that players can advance from the simple to the complex positions. Finding the right answer will bring about a forced checkmate or a winning material superiority. Puzzles cover the gamut from straightforward moves right up to tricky traps. A book for chess winners! Fred Wilson and Bruce Alberston are well-known chess trainers and teachers and are co-authors of 303 Tricky Chess Tactics, 303 Tricky Checkmates, 303 Tricky Chess Puzzles and 202 Checkmates for Children.